Martin led countless individuals in the struggle for civil rights in the United State of America. He was one of the founders of the influential Southern Christian Leadership Conference (SCLC) and gave direction to people looking for a way to resist the powerful and abusive parts of the American power structure. They marched and met and slowly raised the consciousness of the American people in relation to the struggle that they were undergoing simply for equality and justice. 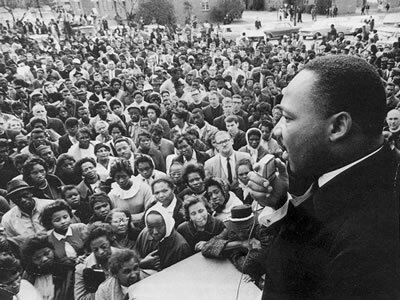 One of the foundational tenets of Martin's leadership was the philosophy of nonviolence. This philosophy led to many sit-ins and passive forms of resistance which proved to be esspecially powerful in a nation where media were looking for a story. He drew the inspiration for how he might best resist nonviolently from Jesus, Gandhi, and the writings of Howard Thurman. With each nonviolent protest, they were met with violent opposition from those who hated their very existence. They absorbed the wrath and evil intentions of their enemies and offered them something resembling love and forgiveness in return. As the violence escalated, Martin and those who followed after him suffered even more. But the power was found in the increased awareness of the rightness of their side and the wrongness of their enemies as their enemies perpetrated great evil in an attempt to remain powerful. In other words, the nonviolent protest of Martin and his people provided a canvas upon which the inherent, institutional evil could take form and be recognized. With every blow and wound they received they gave witness to the evil that motivated such injustice.